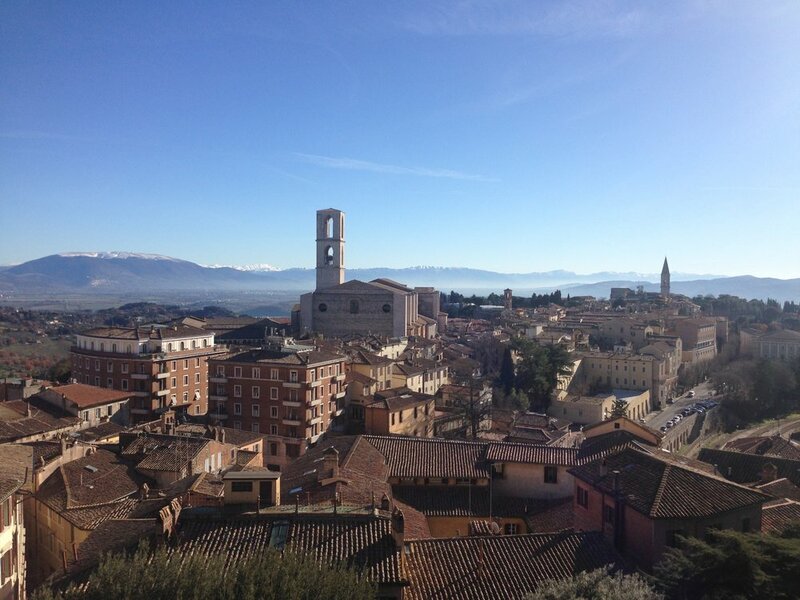 The Perugia City Guide was created by friend, librarian, and Perugia-native, Agave Barone. Piazza IV Novembre (La Fontana, Duomo S. Lorenzo and Palazzo dei Priori) - This fountain is among the best examples of medieval Italian sculpture and was created between 1278 and 1280 by Nicola and Giovanni Pisano to celebrate the completion of the new aqueduct. You'll recognize scenes of the agrarian tradition, months of the year, zodiac signs, biblical scenes, and highlights of Roman history. The three nymphs on the top represent the three theological virtues (Faith, Hope, Charity). Palazzo dei Priori is one of the most interesting examples of Gothic civil constructions in Italy. Take the steps to get in Sala dei Notari and look at the frescoes! Collegio del cambio - If you're passionate about Renaissance art, don't miss this gem in Corso Vannucci. Galleria Nazionale dell'Umbria - The Galleria's collection is the most exhaustive and complete of the region, both for the variety and the large number of masterpieces, from Cimabue to Pietro Vannucci (Raphael's master). Corso Vannucci - This is the most important street in the center of Perugia, connecting Piazza IV Novembre with Piazza Italia and the Giardini Carducci. Rocca Paolina - This fortress is a symbol of Papal power: it was built at the behest of the Pope, Paul III Farnese (1540 -1543), and designed by Antonio da Sangallo the Younger. The fortress was part of the city, you can still see what is left of a formerly wealthy neighbourhood. Nowadays it's fascinating nooks and crannies are venues for art exhibits and markets. Don't forget Porta Marzia, now part of the fort walls, but originally from the 3rd Century B.C. San Pietro and the Orto Botanico - After a long walk in the city center you can take a break at these amazing gardens. Osteria a Priori - Traditional choices with locally sourced ingredients. Slow Food products in a cozy osteria with wooden-beamed ceilings. I highly recommend the Egg truffled stracciatella. La bottega di Perugia - Real street food from Umbria! A super small sandwich spot where only local and traditional products like porchetta or lombetto are used. Wine is served as well. Umbrò - A huge space with a high quality self service restaurant, a little market, a café, a small bookshop, an exhibition hall and a garden! Sandri - Don't miss this historical café on corso Vannucci, Sandri offers great cakes and pastries. Admire the wooden counter, the frescoes, and the over-all elegant atmosphere that even the waiters exude. And, feast your eyes on the amazing shop window! Dispensa 63 - For something sweet to go with your coffee, head to this small bakery that uses the best seasonal ingredients...they have vegan options, too! T-trane - Here you can find special craft beers, listen to all kinds of music, buy vinyls, chat with the bartenders, and enjoy unique gigs and dj sets. Il birraio - A very beautiful place to have a beer or a quick dinner, while enjoying the sunset and the cosmopolitan atmosphere. Postmodernissimo - Modernissimo used to be an art house cinema that closed at the beginning of the new Millennium. The theater reopened 14 years later as Postmodernissimo, thanks to crowdfunding and 4 special guys who really cared about giving this place back to the citizens. You can choose your avant-garde movie while sipping a great bianco from the renewed cafeteria. Umbria Jazz - If you are a big music fan, you will likely already know the Umbria Jazz music festival. Perugia during the festival is full of music, events, concerts and people from all over the world. La terrazza del mercato - On the top of the city market building, you can have a drink and enjoy the panorama and some good music. Punto di vista cafè - A breathtaking view from one of the most beautiful terraces in the city center! Trattoria del borgo - This is a really nice traditional trattoria where everything is delicious: food, people and the restaurant itself, especially when it is warm enough to enjoy dinner in the private garden. Make sure not to get it confused with other restaurants with similar names, this one is in via della Sposa! La fame - One of my favourite restaurants to have a special dinner with fresh fish and really good wine. They have meat and vegan/vegatarian choices, too. Leave room for desserts! Società anonima - Newly opened place where you can just have a drink, an aperitivo, or stay for dinner. Ingredients are local but recipes are really unique. The menu doesn't have categories for appetizers, or first and second courses, you can mix and choose whatever you want and in whatever order you want it. Definitely sui generis! Mediterranea - For a very tasty pizza! Always very crowded, booking a table ahead is recommended. Balù - Music and culture events in a really nice club. Possibly the best beer choices in Perugia. Bottega del vino - Live music (check their program) and very good wines. You can sit and have dinner too. Bavicchi - Here you can find every kind of local bean and legume, dried fruit, sauces, seeds and spices. A complete emporium to smell! Bettini Ceramiche - A lovely ceramic and home decor shop where you can find colorful, artisanal Umbrian pottery. In particular the Deruta majolica is very nice. Umbrò - This is a great place to go and buy traditional and local products, such as Lenticchie di Castelluccio, E. V. O. Oil or Truffle Sauces, on a budget. S. Egidio Airport - The airport is 13 km away, about 25 minutes driving from Perugia's city center. 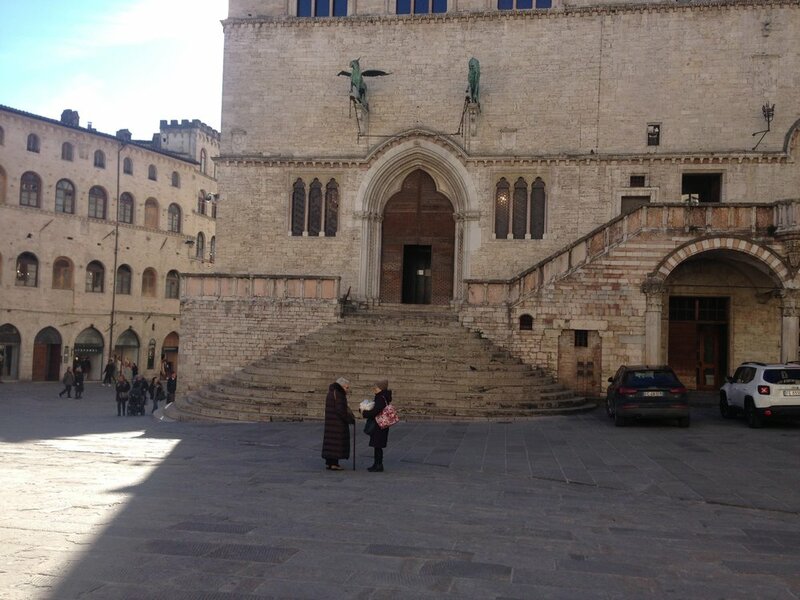 Airport Shuttle – Tickets for Perugia city centre are 2,50 euros each, 3,50 if bought onboard. Train Station – Perugia Centrale with Trenitalia. Bus – UnicoPerugia Ticket is 1,50 euro and you can buy it at a Tabaccheria or Edicola or at a Minimetrò ticket machine. One ticket is valid for 70 minutes, or get a Daily ticket at the cost of 5,40 euros. MiniMetrò – Same as bus ticket. The service connects Pian di Massiano and the Railway Station to the city centre. Check the timetables, it changes in relation to important events in town. Car - The city center is mostly closed off to cars “Zona Traffico Limitato -or- ZTL” (unless you’re a taxi, bus, or resident of that area) in any case it is always very crowded and the traffic can be difficult. I don’t recommended driving around the city, but instead to tour the city on foot. If parking on the street, please take note of the color of the lines: White lines mean parking for residents only, blue lines mean anyone can park there (make sure to see if there is an hourly fee to pay), and yellow lines mean NO parking (either Handicap parking or Bus stops).